The Museum of SuperNatural History™: Could These Possibly Be The Mountain Peaks Of The Lost Continent Of Atlantis? Could These Possibly Be The Mountain Peaks Of The Lost Continent Of Atlantis? 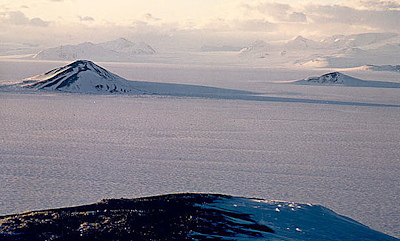 Unlike the North Pole - which is made up entirely of ice - the South Pole is actually a physical mass of land that is covered with ice. And that physical mass of land is not merely any old land, it is one of the 7 continents. And it was the brilliant author Graham Hancock who - in his masterpiece Fingerprints Of The Gods - so provocatively pointed out that an ice-covered continent would be the ideal place to ferret-away something as vast and mythic as the Lost Continent of Atlantis. After all, Hancock writes (and we’re paraphrasing here), while Plato describes Atlantis as an island, he specifies that it is a continent. And you can’t just go an misplace an entire continent. So after scouring the ocean depths, and turning over every toppled column on every island from Cuba to Sardinia, why couldn’t Atlantis be buried under the frozen ice of Antarctica? Now currently, amazingly, swiftly - and tragically - that ice is melting. And what the modern residents of planet Earth are now seeing, for the first time in thousands of years, are what could very likely be the mountain tops of the Lost Continent of Atlantis. Well 600 years ago claiming a “round” Earth could be circumnavigated sounded a little out there, too... after all, everyone KNEW the world was flat. And the legendary city of Troy was considered to be nothing more than a Homeric plot device, until amateur archaeologist Heinrich Schliemann confounded the experts by stubbornly going to the trouble of digging it up. Our point being: if you’re up to it, Flem-Ath sets forth a compelling argument for how and why Antarctica could possibly be the Lost Continent of You-Know-Where.